Moving into or buying a new home is a major milestone in anyone’s life. It’s likely to be the biggest purchase you ever make. As well as being the place you might start a family or be retiring to. Homes are huge parts of our lives and the places we feel most secure. So when someone you know moves into a new house it’s common place to send a card saying congratulations on your new home. A card that acknowledges what a big event this is for them, gently jokes about it or wishes them good luck in their new home is the perfect way to let someone know how pleased you are they’ve found a place of their own. But knowing what to write in a new home card isn’t always as easy as it sounds. 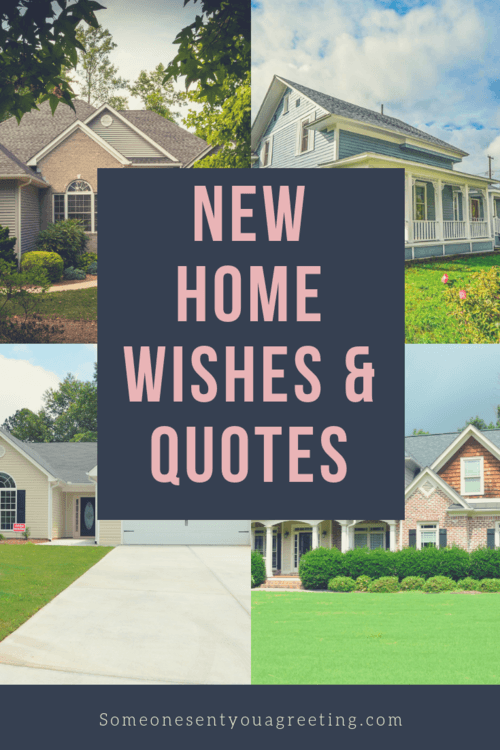 That’s why we’ve compiled this resource of the best new home wishes and quotes. 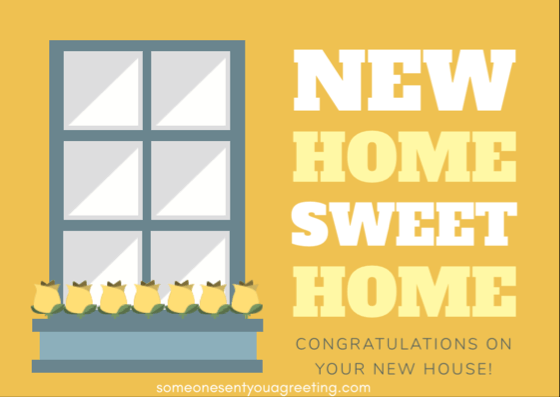 You can use this collection of new home messages below to wish family, friends or even a work colleague ‘congratulations on your new home’. You might even want to get them a housewarming gift to accompany your card. Or just leave a message on their Facebook page if you feel you’re not close enough for that. 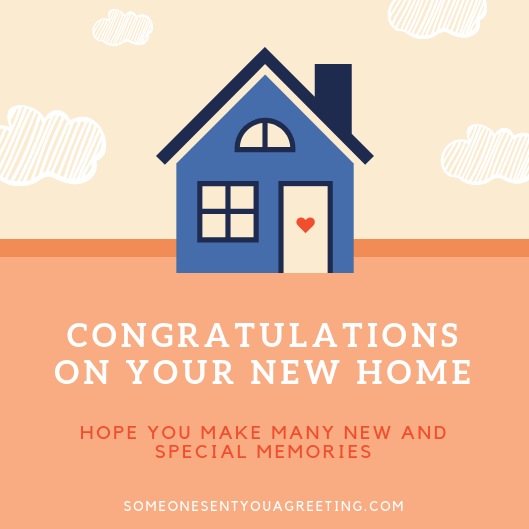 So have a look at the new home wishes below and you should find just what you need to congratulate whoever it is for on their new home. Congratulations on moving into your new home. Wishing you all the best as you settle in. Enjoy your new house and making it the home you’ve always wanted. Congratulations in your lovely new home. I just hope the neighbours are good! a Congratulations! Home sweet home! Congratulations! You can rest now, the move is over. Congratulations, I hope you make many new and special memories in your new home. I hope your new home brings you years of happiness. Congratulations, there’s no place like home. Congratulations on joining the mortgage club! Wishing you all the best in your beautiful new home. Congratulations! May happiness & love move in with you. So pleased to hear about your new home! I’m sure you’ll have so many wonderful times and make amazing memories. Congratulations. I hope your new house becomes a home for you and your family. May your new home be filled with joy and happiness. We’re really excited about you moving in! Wishing you all the best with your new home – hope it works out perfectly. I’m so pleased you’ve finally moved in. Wishing you years of joy and happy memories in your new house. Congratulations on the new house and all of the new experiences that you will have as a homeowner. Congratulations on getting on the property ladder. Here’s hoping in time you make it your own and it becomes the home you’ve always wanted. May the windows and doors of your new home open up to good luck, prosperity and fortune for your entire family. Congratulations. Your new home is not just a new roof over four walls. It marks the beginning of a new life and new memories. Congratulations. May you and your family grow strong, old and happy together in your new home. You’ll always remember that first step into your new home. Congratulations. Wishing that your new home brings you nothing but peace, happiness and contentment. Give your friend or family member a laugh about the move with these funny new home quotes. Sometimes moving into a new house can be stressful so something funny can help to ease the tension and let everyone relax. Congratulations to you moving and congratulations to me for not having to help you move! Your new home may have used up all your life savings, you might be in debt up to your eyeballs and never be able to go out again, but here’s a card – well done. Congratulations! Now you can walk around naked.. but please remember to close the blinds – no one wants to see that! Good luck convincing your neighbours that you’re normal! Congrats on the new home, let me know which room is mine. Well done on moving house.. please send me your Wi-Fi password in advance! Thanks. I hope you remember this moment in your new home forever. Because it will never be this clean or organised ever again. Congratulations. I just hope your new neighbours aren’t ******’s! Your new home is lovely – which is a good job, as you won’t be able to afford to go out anymore! Congratulations on your new home. Sorry that when you needed help I was ill, away on holiday, my car broke down and the dog ate my keys. Home is where your wife rules, a new home is.. still where your wife rules! NO I won’t help with the unpacking and YES I would like to come over for free food and drink. When can I come and visit? I can’t wait to check out your new toilet.. I love your new home so much that I can see myself living there. I’m still waiting for my key? It’s great you finally bought a house; good job they don’t do proper background checks! I can’t wait to overstay my welcome! Congrats on the move. Wish someone good luck in their new home, hoping everything turns out as they hoped and show how happy you are they’re moving into their dream place. You can rent a house but you can never rent a home. Good luck with the new house. Hope your new home is filled with joy. Best of luck with it. Best of luck with your new home. Wishing you happiness and love. May you and your family enjoy years of happy times in your new home. Good luck! Good luck in your new home. I hope all is good in your new hood! May those who visit your home feel the love residing there. Good luck n turning it into the place you always dreamed of. Beautiful couples like you deserve a beautiful homes like yours. Good luck. The day you step into your new home does not make your life complete, but it does make your new home complete. Wishing you the best of luck with moving in. Big hugs and wishing you the best of luck with the move. I know your new house will be just perfect. Good luck and God bless your new house. If you’re the realtor for someone moving into a new house then congratulate them on their move with a card and message from the examples below. I know your new home has cost a lot, but in return it will give you a new life. Congratulations. It’s after a busy day you will truly appreciate your new home and the peace it brings you. Congratulations. Congratulates on your new home. I hate to be the bearer of bad news but the worst part of owning such a beautiful home like yours is that you will never feel like leaving it! May your new home keep you cozy in winter, cool in summer and sheltered during the rains. Congratulations. Im so happy I was able to help you find the house of you’re dreams. Good luck and many blessings on your big move. If you need anything just give me a call. I know it was expensive but I’m sure you and your family will be so happy. Congratulations.